There is job growth in construction but lets look at a few charts and consider the year ahead. Ill start with the bad news and try to offer some encouragement on the back end. Here is the non farm payroll over the last decade. Yah! Its moving upward. The economy is growing right? There is a massive slowdown in retail business. Except for a certain company called “For Lease”… those guys are everywhere. JcPenny and Best buy are in the news today. But many other retailers such as Radio Shack, Sears & Rite Aid are quickly moving the way of circuit city, borders books and the milk man. In summary, don’t expect much new retail development. How about new home construction? Market Watch posted this data. To summarize I believe that new construction will continue in specific regions. Here are a list of states with the least unemployment. Texas and North Dakota are on fire in 2013. That’s the word on the street at least. But any state in the top 20 will be good for construction in 2014. Remodels are a completely different story however. Remodels are often a result of HELOC or Home Equity Line of Credit. As housing prices move upwards in well established states so do loans to remodel and improve them. 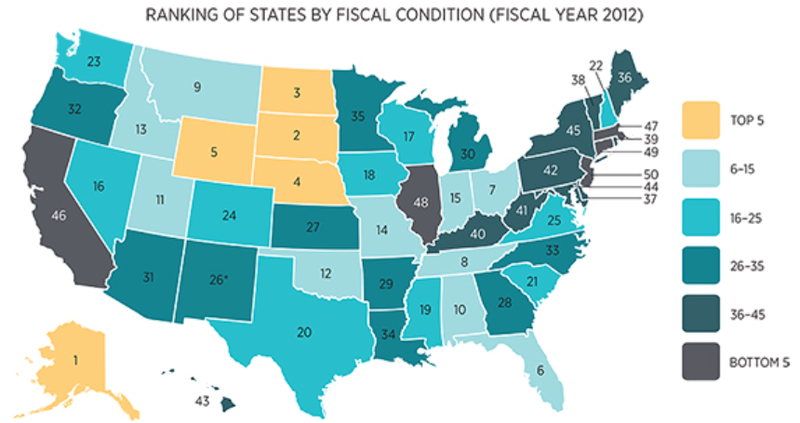 Below is a state by state ranking of the state governments fiscal health. Now I’m no big city economist but it seems to me that eventually all governments now and throughout history have run a budget deficit. The only times they are not running a deficit is when the economy is growing faster than bureaucrats can spend. Here is some insight into which state’s economies are growing fast enough to support the government parasite that threatens to consume us all. I don’t want to bore anyone with further introspection into the economy because at the end of the day there isn’t a whole lot you can change. The important thing to understand for a small construction firm is that your location will dictate what type of work is available. Money is cheap right now due to low interest rates and quantitative easing. Investors, looking for a return on their money are building speculative properties or buying overpriced stocks hoping to buy high and sell higher. But remember buy low and sell high. Cash is cheap so hoard your cash(buy) and don’t invest. When the fed attempts to cool down the markets and interest rates rise it will be time to spend(sell) that cash keeping your business or family afloat.